Layne and Nathan are twins. Both brothers spend a lot of time at Canuck Place. Nathan is on the Canuck Place program, Layne isn’t, but he often accompanies his brother during respite stays, and he is now a proud member of Team Canuck Place. 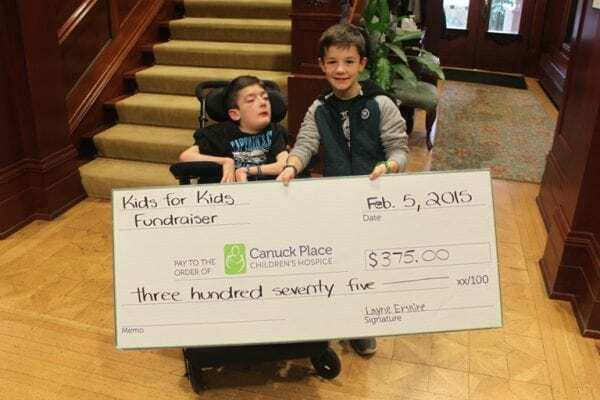 Layne was inspired by his brother and his experience at Canuck Place to raise funds for the place that helps Nathan. He makes rainbow loom wristbands, and sells them for a suggested donation of $2 at the salon where his mom works. It’s become quite the family affair, mom and grandma have joined in on selling, their old brother helped make the displays, and everyone has taken a turn at learning how to make wristbands – the number now reaches well over 100. The whole family is excited for the David Lede House in Abbotsford to open for respite stays, so they can stay closer to home, and eagerly anticipate the opportunity to utilize both locations. Meanwhile, Layne intends to keep making bracelets to help support an organization very close to his young heart. Find out more about Team Canuck Place, and how you can organize your own fundraiser.